Resistance respiratory muscle training has recently been demonstrated to reduce the blood pressure in a population of people in their 50's with 4-5 years of hypertension which were being treated with medication. Participants with metabolic syndrome were excluded. Patients in the unloaded breathing group inhaled deeply through the device with the inlet tube set just above the level of the fluid so the inspired air was humidifed but there was no added resistance. For the loaded breathing group, the water level was set to provide an inspiratory load of 20 cmH 0. The patients were instructed to adopt a breathing pattern with a controlled fow rate of about 200 ml/sec, an inspiratory time of 4 seconds, and a total respiratory time of 10 seconds. The paced breathing was frst practised using a metronome in the laboratory until it could be reliably performed without the metronome. Patients rested for 5 seconds after every 6 deep breaths. Training was performed at home for 30 minutes, twice a day, every day for 8 weeks. Patients in the control group were asked to continue with their normal daily life. Compared to the control group, systolic and diastolic blood pressure decreased signifcantly with unloaded breathing by means of 7.0 mmHg (95% CI 5.5 to 8.5) and 13.5 mmHg (95% CI 11.3 to 15.7), respectively (laboratory measures). With loaded breathing, the reductions were greater at 18.8 mmHg (95% CI 16.1 to 21.5) and 8.6 mmHg (95% CI 6.8 to 10.4), respectively. The improvement in systolic blood pressure was 5.3 mmHg (95% CI 1.0 to 9.6) greater than with unloaded breathing. Heart rate declined by 8 beats/min (95% CI 6.5 to 10.3) with unloaded breathing, and 9 beats/min (95% CI 5.6 to 12.2) with loaded breathing. A simple device was used whereby a water bottle with an inhalation mouthpiece and an air intake straw was used. The straw was 20cm deep inside the water to obtain the required resistance. Training duration was for 30 minutes per day. The mechanism of action has been suggested to be improved sympathetic tone. 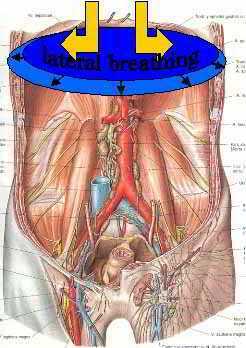 It would also be interesting to hypothesis that the lateral expansion of the ribcage, through the engagement of the diaphragm, results in the drawing upward and outward the myofascia of the Psoas Major, taking some pressure off the deep abdominal blood vessels such as the vena cava. Ageing has been associated with reduced arterial vasodilation and hypertension. Elevation of free oxygen radicals are thought to inactivate Nitrous Oxide (NO). Using a severe hand-gripping model, Shoemaker et al (Am J Physiol, 1997; 273, H23488-95) were able to demonstrate 7% vasodilation in young subjects versus only 3% brachial vasodilation in older individuals. Anecdotal evidence supporting the use of oral antioxidant supplementation comes from Japanese, Scandinavian and Italian populations where a high incidence of centenarians has been associated with diet. However, the use of oral antioxidants alone, in the abscence of exercise, has not been shown to reduce the risk of cardiovascular disease. Paradoxically, administration of high levels of Vitamin C after exercise seem to reduce the vasodilatory effect of exercise, suggesting some positive 'down-stream' effects of oxygen free radicals on cardiovascular health (Wry et al 2011, Exerc & Sp Sci Rev, 39, 2, 68-76). Alternatively, the chronic balance of oxygen free radicals and their complementary antioxidants may be more important, suggesting regular exercise and dietry function rather than extremes of either are more significant contributors to cardiovascular health. Investigations, using small muscle mass oxidative stress such as knee extension training, which have minimal central cardiovascular responses, have demonstrated positive cardiovascular effects on blood pressure function (Richardson et al 2004, Am J Resp Crit Care Med, 169, 1, 89-96; Shephard et al 1997, Sports Medicine, 23, 2, 75-92). Such findings are important in subjects with central cardiovascular compromise, but moreover have an impact on exercise adherence where subjects do not enjoy whole body high oxidative stress exercise. Furthermore, although blood pressure wasn't shown to be effected by acute antioxidant supplementation, the muscle perfusion post exercise was 30-40% greater in the older individuals receiving supplementation (Wry et al 2009, Clin Sci (Lond. ), 116, 5, 433-41). Moreover, phosphate markers of post exercise skeletal muscle energetics suggests further positive benefits of antioxidant supplementation in older individuals (Wry et all 2011, Exerc & Sp Sci Rev, 39, 2, 68-76). Therefore, regardless of the reduction in perfusion during exercise, post exercise effects of antioxidant supplemenation and the known increased functional capacity of trained individuals suggest efficient physiological musculoskeletal compensation, to mitigate against the aging process. At Back In Business Physiotherapy we have been recommending people commence using such a strategy as resistance breathing using Power Breath apparatus, to help improve peoples blood pressure problems. Furthermore, we have recommended it's use in clients with Low back Pain to improve diaphragmatic lateral expansion, core stability and the engagement of the pelvic floor muscles. Effect of inspiratory muscle training on exercise tolerance in asthmatic individuals. Inspiratory muscle training has been shown to attenuate inspiratory muscle fatigue, reduces the perception of dyspnea, and increases exercise tolerance in people with mild to moderate asthma (FEV>70%). Training consisted of 30 inspiratory breaths, twice a day using a PowerBreathe device, at a pressure thtreshold 50 % of PImax, for 6 weeks. Turner et al (2011, Med Sci in Sp Ex, 43, 11, 2031-2038) findings included an increase in inspiratory muscle strength of 27%. Other investigations have demonstrated these results could be due to an increased thickness of the diaphragm as well as hypertrophy (Downey et al 2007 Resp Physiol Neurobiol, 156, 2, 137-146) of type I and type II external intercostal muscles (Ramirez-Sarmiento et al 2002, Am J Respir Crit Care Medicine, 166, 11, 1491-1497). Pulmonary function (FEV1 and FVC) weren't shown to change after 6 weeks of training, but have been shown to improve by 12% after 3-6 months of training amongst individuals with moderate to severe asthma (Weiner et al 2000, Chest, 117, 3, 722-727). Frequently, individuals with asthma have a reduction in exercise tolerance due to expiratory flow limitation and dynamic hyperinflation (EELV). The investigation by Turner et al (2011) demonstrated that this affect was attenuated at both the onset of exercise and during exercise, which likely explains the improved oxygen consumption seen in the inspiratory trained individuals. Deep inspiration amongst individuals with asthma commonly results in a 'latched state' of smooth muscle stiffness and bronchial constriction. In contrast, deep inhalation with a pressure loading seems to release the 'latched state' resulting in less bronchoconstriction (How et al 2009, Respir Physiol Neurobiol, 166, 3, 159-163). It has been demonstrated that 29% of people with type 2 diabetes present with inspiratory muscle weakness. After 8 weeks of training it was shown that IMT significantly increases inpiratory muscle pressure by 118% and the inspiratory muscle endurance time by 495% (Correa et al 2011, 43, 7, 1135 - 1141). This result is particularly important as the sensation of perceived breathlessness can be a significant negating factor in peoples adherence to exercise. Since, exercise is such an important aspect of improving the morbidity of type 2 diabetes then training program design needs to consider IMT in their exericise prescription. Habituation of the early pain-sensitivity respiratory response in sustained pain.